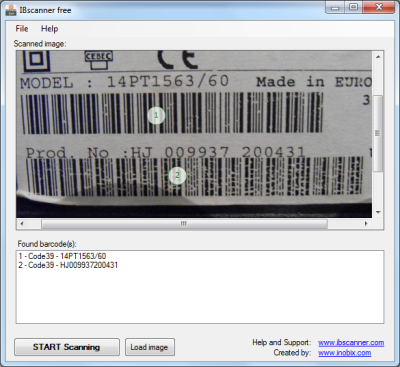 IBscannerApp is a free barcode reader application for Windows, that integrates the functionality of IBscanner .NET. It works with the standard file formats JPEG, PNG, TIFF, GIF and supports a large list of command-line parameters that you can use for integration with your software products. It is compatible with Microsoft Windows XP, Vista, Windows 7, Windows 8. Requires .NET 2.0 or higher. IBscannerApp supports a detection of 10+ linear barcode types (Interleaved 2/5, Industrial 2/5, Code 39, Code 39 Extended, Codabar, Code 11, Code 128, Code 128 Extended, EAN/UCC 128, UPC-E, UPC-A, EAN-8, EAN-13, Code 93, Code 93 Extended).